Digitization Dispatch: A Rose By Any Other Name…Still Has an Historically Accurate Rendering as Accessory! It might be a little confusing to keep up with the digital humanities collection that provides the basis for most of these posts. The collection that began as HAC (History, Art, and culture), spent a brief adolescence as SHAC (Smithsonian History, Art, and Culture), has now matured into the CHL (rhymes with BHL!). The Cultural Heritage Library is still available here, and still includes the same content from the history, art, and culture locations; the name changes simply reflect the evolving nature of this arm our digitization practices. Currently at 3,670 items, the CHL features new additions every week. 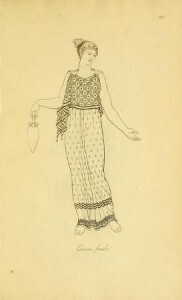 But one of the titles that has been distracting me lately was scanned back in 2010: Costume of the Ancients (2 Volumes). Ostensibly, this is a guide for painters depicting historical scenes. “To attempt representing a real event, and to violate in execution all truth to costume…is before-hand to wantonly mar the best fruits of one’s labor, the applause of the judicious.” Indeed. But even if faithful representation with oil and canvas isn’t your goal, this title is pretty dreamy. Plate after plate of delicately rendered figures in historically accurate dress, complete with description and habits of the culture in which they were in use provide a vivid sense of detail of ancient civilization for any reader. Insights into agriculture, for example, are revealed as the author describes textiles manufacturing. You can find both volumes online at the Internet Archive here and here, along with the rest of the CHL!